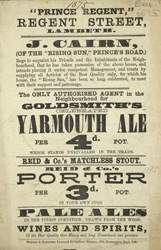 This leaflet features an advertisement for the Prince Regent Public House in Lambeth. The abbreviated slang term 'pub' dates from the mid-19th century. It was at the heart of most working men's leisure time. Wages were often given out in pubs at noon. This unfortunately meant that many working men spent their money on drink, leaving their families as destitute as ever.